Three run outs hampered KXIP's plans to score a decent total againsr RCB. The 48th match of the IPL 2018 saw Kings XI Punjab host Royal Challengers Bangalore at the Holkar stadium, Bangalore. RCB was in a dire need of a win to stay relevant in the tournament. KXIP wanted to stem their losing trot, while RCB wanted to keep winning. Virat Kohli won the toss and chose to field first. RCB went in with no changes, and KXIP replaced the injured Mujeeb with Stoinis and Ankit Rajpoot came in for Barinder Sran. With both Mujeeb and Sran out of the team, Kings XI did not have a single bowler tonight, who has dismissed Kohli in the IPL. RCB were looking to wrap KXIP for as low score as possible. KL Rahul seemed to be intent on foiling their plan, as he hit 3 sixes in his 21 off 15 balls. Chris Gayle looked out of touch during his 18. But Umesh Yadav had other thoughts as he wrapped both the openers with 41 runs on the board and Siraj removed Nair for 1. Aaron Finch tried to stem the fall of wickets with 26 off 23 balls, but KXIP batsmen went hell-bent on getting out, as three of their batsmen got run out in the innings. Umesh Yadav picked 3/23 and Chahal, Siraj, De Grandhomme and Ali picked a wicket each. KXIP committed hara-kiri to get all out for 88 runs on board. RCB knew the importance of finishing the match with a better net run rate and opened with Parthiv and Virat. Both the openers took the KXIP bowlers to task and ensured that they achieved the target as early as possible. 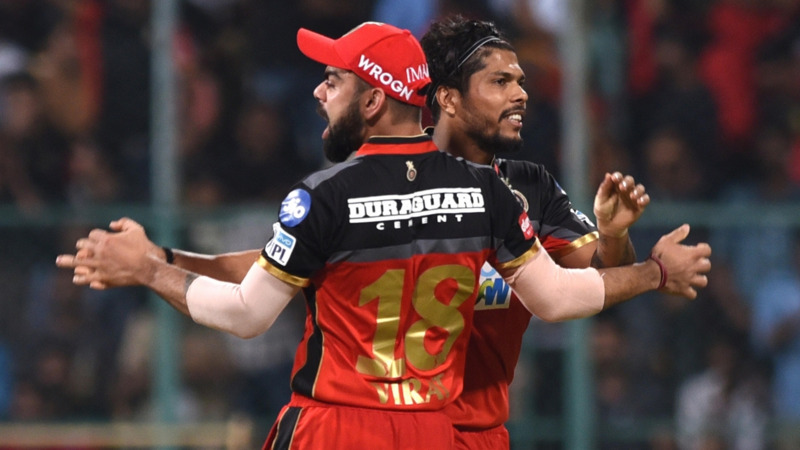 In the end, Virat Kohli (48* in 28 balls; 6x4s, 2x6s) and Parthiv Patel (40* in 22 balls; 7x4s) finished the game in the 9th over and kept RCB alive in the tournament.